Yesterday was this third installment of Bike Miami Days, the City of Miami’s monthly event promoting a bicycle-friendly environment and lifestyle in Downtown Miami. This month’s event featured a new route extension all the way from Downtown to the Miami Riverfront and Lummus Landing, plus the tried-and-true route south into Mary Brickell Village, though the Bayfront Park section from previous events was shut down for this one due to a festival the night before and the lack of time to prepare the park for public use. 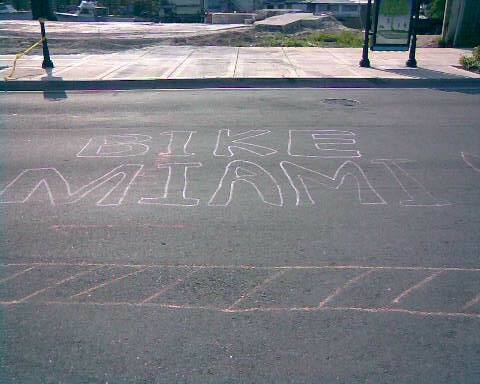 In short, Bike Miami 3 was a resounding success, paralleling the level of enthusiasm and attendance of the first Bike Miami in November 2008. There was a rally at Lummus Landing at 10:30 am to kick-off the day and events at Lummus and Mary Brickell, things like Yoga classes and performances by local musicians, all free. There were also free bike rentals, a welcomed addition for those who don’t have bikes of their own yet want to take part in the event. Local businesses also took part, starting a trend I’d like to see continue, bringing commercial support to the event. Downtown Miami’s businesses also took up the banner, opening their stores en masse, and even engaging with the riders. Kay Kirk Jeweler’s was again handing out water in front of their store, and there was a live band playing near the courthouse on Flager Ave, livening up the brisk afternoon. Once more, families made up a significant segment of the participants; it was fantastic to see all the kids riding around Downtown with their parents. I will echo something said over at Miami Bike Scene, though: cyclists need to learn the rules of riding, especially parents when they are bringing their kids over. It would be a shame to have an accident at a Bike Miami event, especially when it could be prevented simply observing common sense when on two wheels. Bike Miami 4 will return in February in conjunction with Flagler Fest.